Financial Sector Reform after the Subprime Crisis: Has Anything Happened? After the near-collapse of large parts of the financial system and unprecedented bail-outs in the subprime crisis, the leaders of the G20 agreed on the need to overhaul the financial system. Concurrently, several countries initiated ambitious reforms at national level, ranging from the isolation of investment banking activities (Dodd-Frank Act in the US and Vickers Reform in the UK) to resolution regimes (restructuring law in Germany) and increased capital buffers for systemically important institutions (too-big-to-fail regulation in Switzerland). The extent of this regulatory activity stands in contrast to the widespread public perception that nothing major has happened on financial markets and that reforms have not had any impact. Therefore, we assess empirically whether these reforms had any measurable effects on financial markets. In our study, we investigate the following questions: How did financial markets react to the different types of national regulatory reforms? Particularly, were bank equity valuations and prices of banks’ credit risk affected? And did different regulatory interventions lead to differing effects on different types of banks, such as investment banks or systemic banks? To answer these questions, we analyse the reaction of equity returns and credit default swap spreads (CDS spreads) in response to national banking reform streams within the framework of an event study. If a financial reform is effective in reducing banks’ bail-out expectations, financial markets are expected to demand higher risk premiums. This would then be reflected in a rise in CDS spreads and a drop in stock returns. Our results reveal that the public perception that nothing has happened after the crisis does not do justice to the analysed national reforms. Overall, all national reforms lead to a drop in stock returns and a rise in CDS spreads, pointing to a decrease in bail-out expectations. 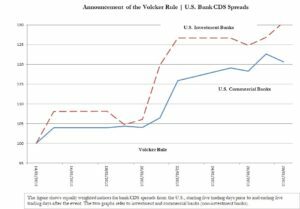 The largest effects occurred for the Dodd-Frank Act and the Vickers Reform, indicated by a sharp increase in CDS spreads (see figure for the Volcker Rule) and a notable decrease in banks’ equity values. The effects were particularly strong for the targeted investment and systemic banks but partly reverted when these reforms were diluted or postponed. The effects of the too-big-to-fail regulation in Switzerland and the German restructuring law were comparatively small. But this does not necessarily mean that these reforms were ineffective. The reform process in Switzerland was still ongoing, and Swiss banks may have been perceived to be safer due to higher capital requirements. The effects for Germany may be small because a national restructuring regime cannot handle cross-border bank failures, which were especially relevant in the global financial crisis. So has anything happened in financial regulation after the subprime crisis? The good news is that the answer is yes. Whether this has been enough cannot be answered with this paper. This is a question for future research.